Founded in 1911 in Pesaro just down the road from Misano Circuit Marco Simoncelli, Benelli can be said to be the oldest surviving Italian motorcycle name. The company has certainly had its ups and downs over the last 100 years; the highlights being winning the 1939 Lightweight TT in the hands of Ted Mellors, the 250cc World Championship and Lightweight TT in 1950 with Dario Ambrosini on board and the same again in 1969 with the fabulous 4-cylinder 250 ridden by Australian Kel Carruthers. Benelli has also had its lows along the way, stepping off the bottom rung of the ladder in the ownership of Argentinian Industrialist Alejandro de Tomaso when all production ceased in 1988 and the factory was sold off. After a failed attempt to restart in 1989, six years later the Benelli name was purchased by Andrea Merloni (Indesit washing machines) and the Tornado Tre900 was launched in 2002 remaining in production in its final incarnation as the 1131cc R160 until 2014. It was said to have a fabulous engine and great handling but unfortunately gained a reputation for poor reliability. So perhaps the purchase of Benelli in 2005 by giant Qjian Jiang Group of Wenling, China will finally put the once-famous marque back on the map. QJ itself has recently received a huge boost in capital following acquisition of a 29.8% share by the third largest car maker in China, Zhejiang Geely Holding Group Co (owners of Volvo, Lotus Cars, London Taxi Co). 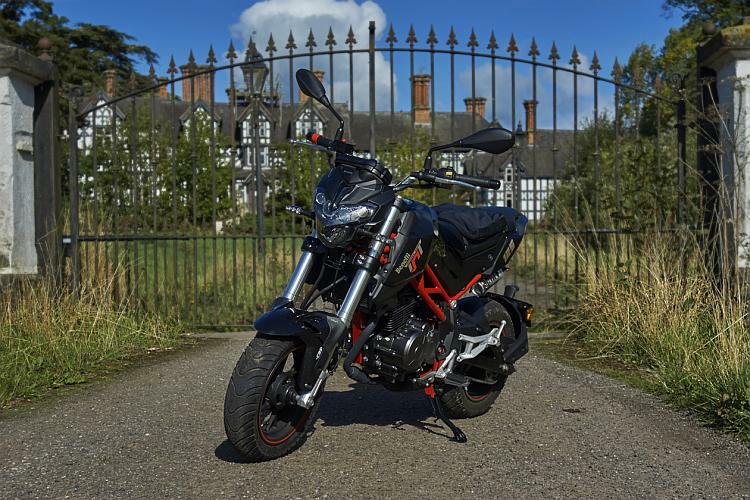 We know QJ in the UK for the Keeway RKS125, a reasonably-priced commuter/learner bike and its various derivatives. Up to 2014 the Benelli logo has been put on several Keeway models which has done little to rebuild an identity as a separate brand. All that is set to change; interviewed for MCN in 2016, General Manager Ms Yan Haimei (known as Klara in the trade for some reason!) said “Benelli’s heritage is very important to us and it is still an Italian brand. We do all the research, design and development in Italy and the Chinese manufacture the product. All the new motorcycle technology is coming from Europe, especially Italy, and they have more creativity than the Chinese, but the Chinese are very good at manufacturing. That’s why Benelli works so well. 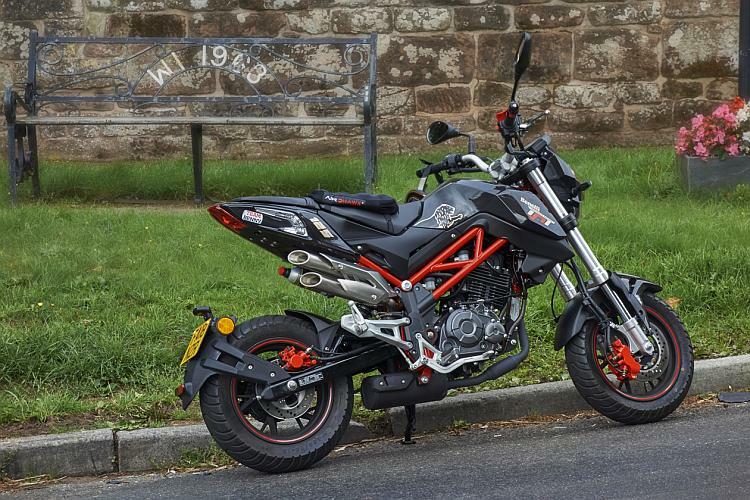 We also believe that we can match the Japanese when it comes to quality.” In 2014 the first stand-alone Benelli designed models began to appear, the BN302 and two years later the TRK502 twin cylinder 500 Adv bike and in 2017 the subject of this review, the diminutive TnT125 Tornado. 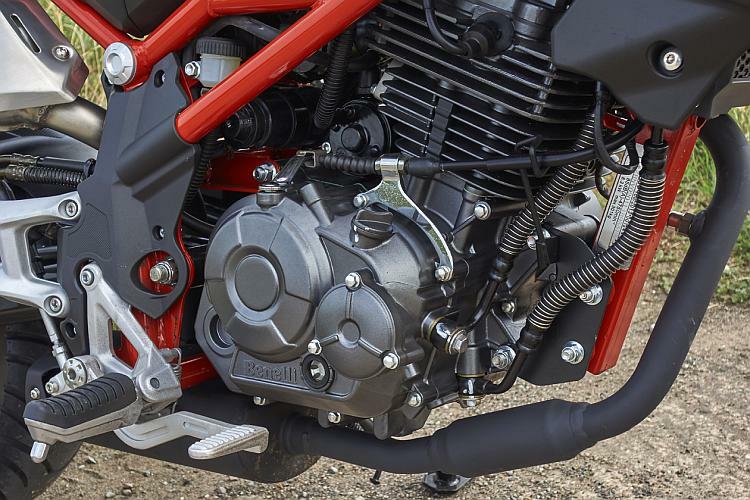 These models were followed earlier this year with the Leoncino featuring a liquid cooled 500 twin with six speed 'box and to come in 2019 will be further new models. According to Marketing Director for the Americas, Asia and Africa regions Dante Bustos “In terms of engine platforms, we are seeking to expand very rapidly in these two segments, the 400 and 750, and we will have different type of frames in different types of bikes. We cannot release too many models in a year, but we plan to release a 250, a 400 and 750 between 2018 and 2019”. 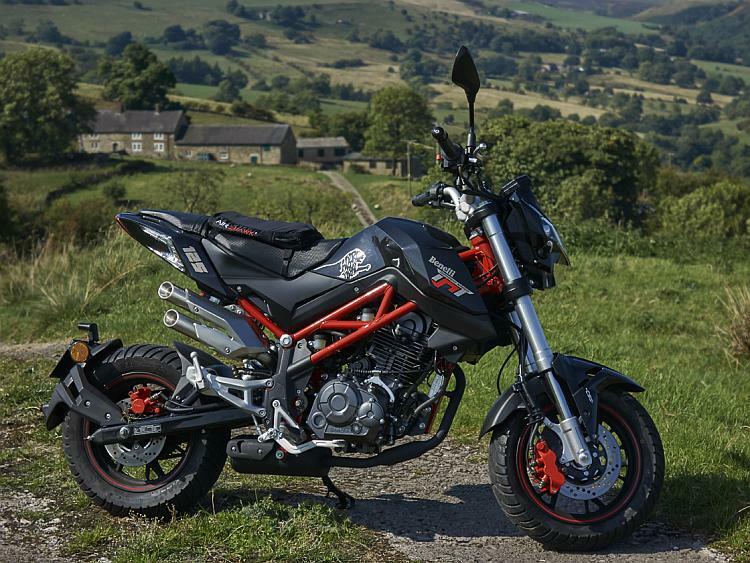 So it does look as though Benelli QJ are indeed setting out to re-establish the once-famous name and carve out a share of the world motorcycle market. For the European market Benelli branded machines are designed in Italy, made in China and shipped to Pesaro for final QC. Time to take a look at the product. The TnT125 Tornado Naked T to give it its full name, is very small but perfectly formed. 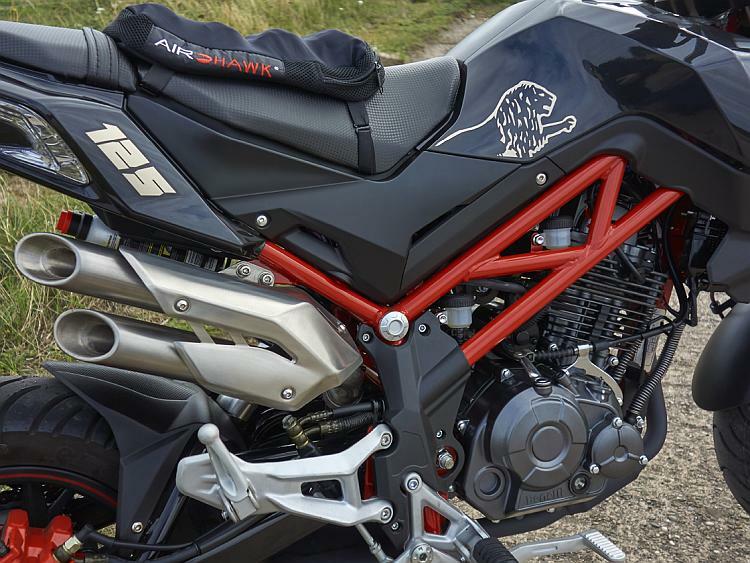 The look is pure streetfighter - trellis frame, steep fork angle, short wheelbase, slash-cut twin exhausts a la MV, futuristic headlight cowl with two twin LED running lights, monoshock at the back, hard-edged tank all add up to one cool package. Cockpit is nice, ally bars set in a cast aluminium clamp at a good reach and height, switchgear is standard modern except for an additional red button on the right for hazard warning lights which you've always wanted on a bike . . . oh yes you have, you know you have! In the instrument pod are analogue rev counter, digi speedo which is switchable between km and miles (and over-reads by 12%) plus a fuel gauge, clock, and mileage-recorder/trip combined; all easy to read day or night and look stylish. The indicators are LED front and back, ultra cool and at the front the little itty-bitty sort you'd put on as after-markets, only Benelli have done it for you. They are very bright and even the most texting-preoccupied yummy mummy 4x4 driver will see them . . . hopefully! The running lights/headlight under the front cowl look the d's b's but unfortunately although they're bright enough the spread on main beam is way too narrow. The way to get round it is to hot-wire the LED dipped beam lights to remain on with the main beam - not a difficult mod and there's plenty of 'how to' advice on the internet. The front footrests are very neat rubber-faced cast aluminium which fold, but bizarrely there are no return springs so if you catch one at the lights when you set off the next 200 yards are spent trying to hook it out with your boot. A pillion seat and rests are provided if you need to take a small child anywhere (adults needn't apply, they just wouldn't fit). The mirrors are very la mode but not a lot of use unless you have a particularly nice jacket and like looking at the cut of the Goretex around the elbows - you're far safer using the 'life-saver' anyway so don't moan. The whole package weighs in at 121kg wet and the 780mm seat height is low enough for someone of 5' or so to get their feet on the floor. At 5'9” the footrest/seat/handlebar triangle aided by cutouts in the side of the tank for the knees is about right for me although the position is more supermotard than tourer. In fact this is one of my main gripes, some people report the seat as being quite comfortable but I find it as hard as a Chapel pew and slopes forward. That aside, the TnT certainly looks the biz. Three colour schemes are available, black with red frame, white with red frame and red with black frame. Oh, and the brake calipers are red on all models. The air/oil cooled 4T 124.8cc (bore 54mm stroke 54.5mm) twin-spark engine produces 11bhp at 9,000 rpm with max torque of 7 lbs ft at 7,000. The rev limiter activates a tad under 10,000 rpm but in practice there's not much point in holding on above 9,500 as the power drops off and a change up on the close-ratio 5 speed box will take you nicely back onto the curve in the next gear. Should mention the light action clutch and smooth gearchange here, not once have I found a false neutral in all the time I've had the TnT. The short-throw pedal has a very precise action and its easy to find neutral at the lights with a glance at the green N on the dash just to confirm. Providing one remembers to fold the side stand and pull the clutch a single press of the starter and it fires up, soon settling to an idle of 1,500 rpm. First gear engages very smoothly but its a low ratio so 2nd comes up as soon as Benny sets off (well, he had to have a nickname didn't he?). As a Fat Man on a Very Small Motorcycle acceleration is steady rather than brisk but the little engine is very willing. Throttle response is instantaneous, probably the result of a light flywheel and a well sorted EFI system. During the running-in period (important on an air-cooled engine to follow manufacturer's instructions) I achieved 124.8 mpg, although having completed the first 1,000 miles I'm now opening it up and the economy has dropped to about 105mpg, giving the 7 litre tank a range of 180 miles. The design of the filler is very good, the level is easy to see in the tank avoiding spillage. For a single the engine is remarkably vibration free, just a bit buzzy through the bars at higher revs, nothing too much and the mirrors show no signs of vibes at any time. The only other characteristic of note is the slight clatter from the SOHC four-valve head at partial throttle openings, its not serious and you soon get used to it. The engine castings and shiny grey finish are first class and the 10W-40 semi-synthetic oil stays on the inside. Level checking is by sight glass on the right side of the sump. At the back the offset monoshock is pre-load adjustable but even with my weight I have it just a few turns up from the softest setting - so for someone lighter it might be quite a firm ride at the back. The 41mm upside-down forks are simply massive for a little motorcycle (the 6 cylinder Honda CBX1000 only had 35mm front forks!). Travel at both ends is just under 5” but bearing in mind the 12” wheels, the suspension does a reasonable job of soaking up most of the potholes on 'impoverished' Britain's neglected roads system. 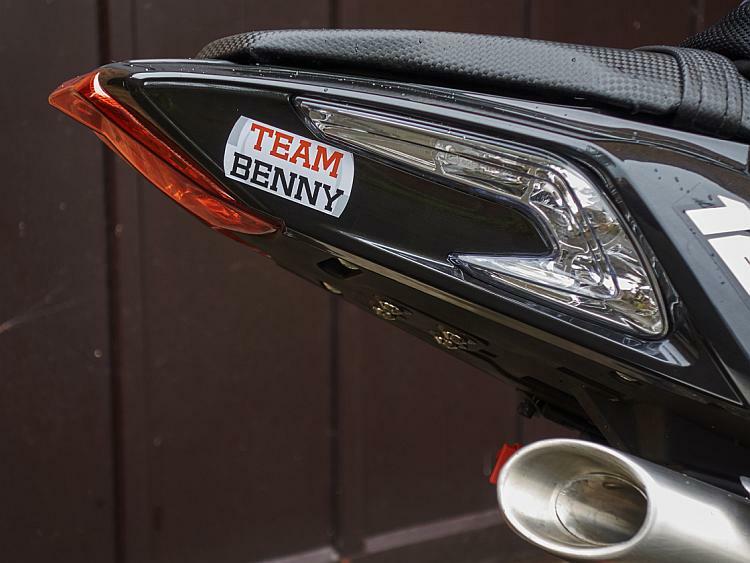 To meet Euro IV, bikes sold in the UK either have to have ABS or Combined Braking System - Benny has the latter. 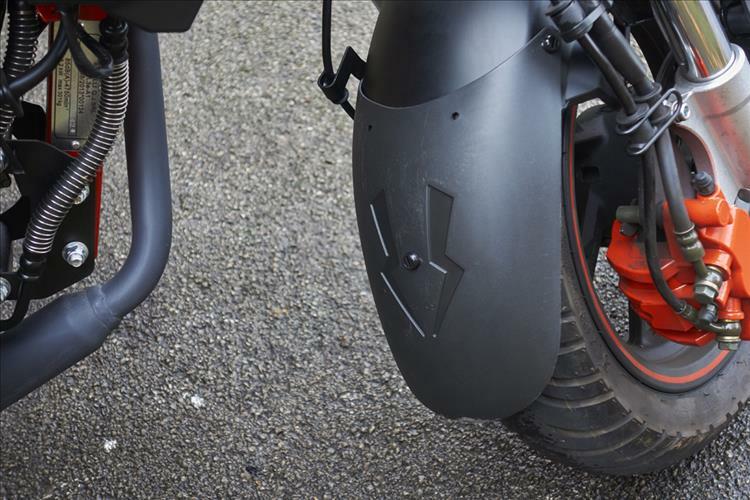 The brake pedal operates on the rear disc together with the centre pot of the 3-pot caliper on the single front disc, the handlebar lever operates the other two pots at the front. 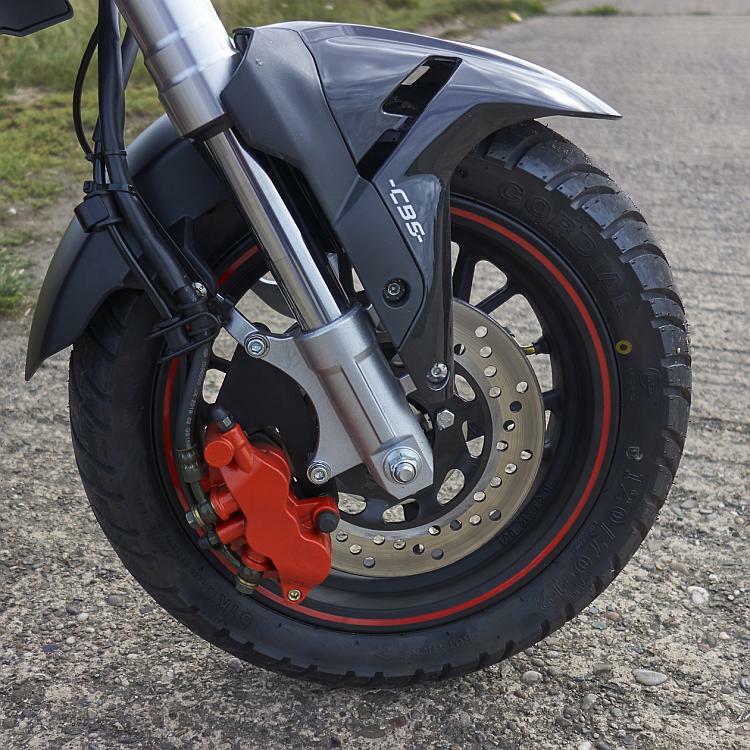 Some users have criticised the set up for a soft brake pedal and lack of feel but having grown up with the system on other bikes such as Guzzis, I like it. I have never been too keen on a rear brake that bites hard since one bright and sunny afternoon I locked the back wheel on a Honda CB650 and threw it up the road . . . but thats another story of broken bike, torn jeans, and tears before bed! The front brake on the TnT125 is progressive and again not too sharp - both brakes used together (as you should) work well and give a feeling of safety. You're getting impatient now, aren't you? “When will he get to the point? He's got this far and hasn't mentioned the 'Made in China' label and 'Quality' ?” Well I haven't because its not an issue. The Benelli TnT125 is very well made: the frame welding is neat, the paint is good, the alloy castings are superb, the plastic bodyparts such as the tank cover, headlight/instrument pod and seat/tail unit are quality mouldings and the wiring loom and connectors are neat and fit-for-purpose. A lot of the fasteners are Allen head bolts which are practical in use and look good and generally the fit and finish is well up to modern quality standards. 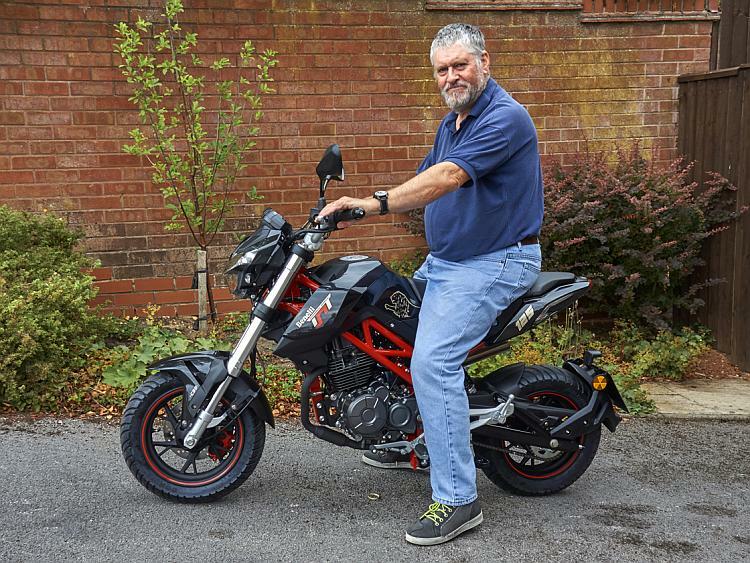 One TnT125 internet group has 1,000 members and so far there've been very few reports of quality/reliability issues, some owners having covered in excess of 10,000 miles in all types of weather with no problems. One owner has posted of trouble engine starting but did not say whether this was due to the starter motor, relay, battery or some other fault. Another reported a cracked frame at the bottom rear engine mounting but it later transpired he was using his bike for public display stunts - that isn't in the TnT's job description! 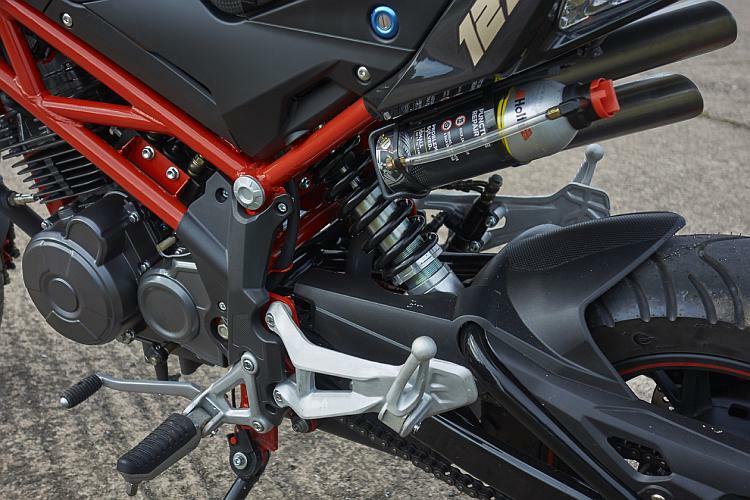 There has also been a Dealer recall for the swing arm bolt to be checked as this can come loose, as can the 6mm shouldered bolt which holds the gear change shaft to the footrest hangar. Its not easy to get to but owners can check the tightness and paint mark it. On close inspection of my Benny I noticed that in fact most of the major fasteners are paint marked at the factory which makes a visual check very easy every time one washes the bike. The chain is an O ring type and if its properly maintained and adjusted it will give good service. The other major gripe on internet groups is the Chinese 'Cordial' tyres. However in my experience in the dry they give as good a level of grip as anything (my chicken strips are long gone) but I do tend to be a bit cautious in the wet anyway and apart from one lurid slide on a river of mud and cow slurry running across a main road (my thanks to the local NFU member for that one!) I haven't had a problem. The TnT125 isn't a big bike and it doesn't have a lot of cc's but it does have a big heart. On country lanes and B roads as long as the revs are kept in the 6,500 to 9,500 rpm power band it nips along pretty smartly. On A roads Benny keeps up well with the traffic cruising happily at an indicated 55-60mph. The CBS brakes work very nicely in practice, the pedal is a little soft but the lever is progressive with plenty of feel and won't lock up the front unless you really, really want to! The TnT is safe for less experienced riders and older ones can show off and look good without throwing it away. I've added a couple of extras to Benny to make life a bit easier, an Airhawk comfort seat, a plastic 'cruise control' which fits on the twist grip (arthritis in the thumb joint) and I've modified a fire-extinguisher bracket to take a bottle of Halfords Tyreweld under the tail unit. At £2099 OTR the only other ways you can spend your money and get half as much fun is on a 3 year old Honda Grom which looks like a monkey bike, has a slipping clutch and fuel pump problems, or perhaps a week's all-inclusive for two in Marbella. If you're short and don't weigh much, seventeen years old and live in a city you'd be mad not to buy one . . . or if you're big and fat, seventy and live in the country you'd also be mad not to buy one. Which is why I bought one. It makes me grin just to look at it, it makes me grin every moment I'm riding it and it makes me grin afterwards when I'm sat in front of the telly remembering what FUN its been today . . . . and every time I ride it. If you'd like to send your review of your bike to be published the contact ren@bikesandtravels.com. Don't worry if it's not as professional or well crafted as Nigel's - it's your opinions and experience that matter. Thank you very much for this Nigel. By the way...twin spark...you did say twin spark right? Really good to here from another mature (I am 56) TNT125 owner, and the "small is beautiful" philosophy by E. F Schumacher, which I have previously quoted on this site. 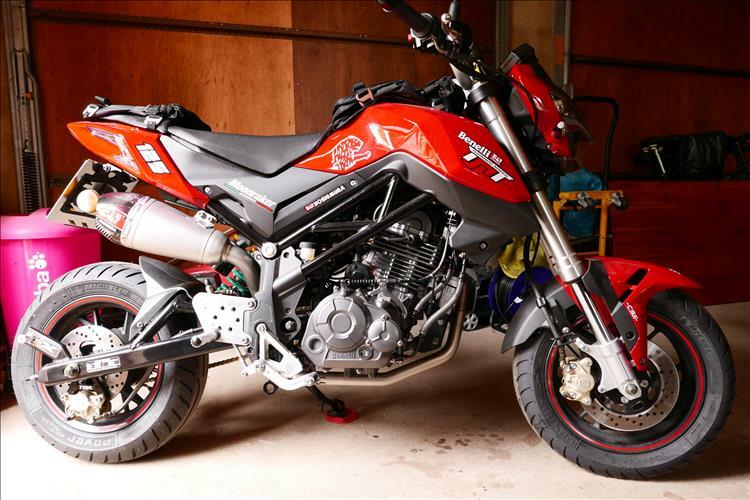 is to spend the (new price-differential, I paid £1995.for mine) money on customising the Benelli to have something more personal, as opposed to standard/mass produced. 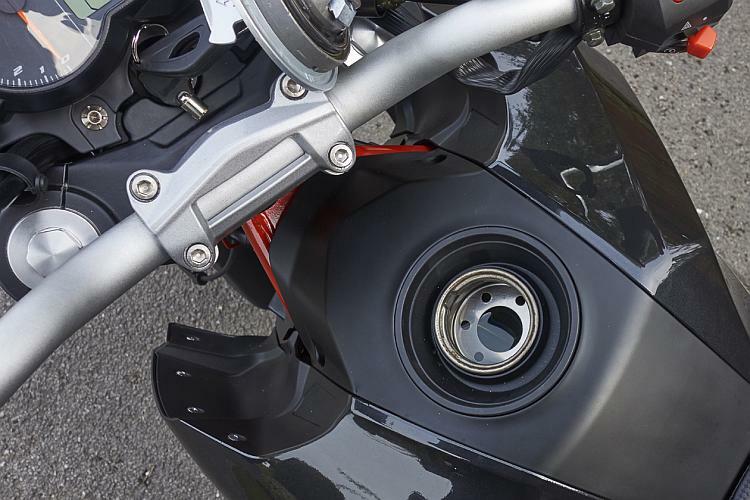 The TNT135 version has recently been introduced to the USA, so its likely there will soon be more after market parts available to play with (e.g Yoshimura already have a full system exhaust out) as opposed to the expensive "bling" anodised this and that, the importer offers. The rear-sets are hand-made. In addition to the mods. you can see, I have also changed the front sprocket from std.15t to 14t, for improved pick-up, pulling in 5th gear. David Barwick, Norfolk, September, 2018. Great comprehensive review. I just wish bike manufacturers would just spend £ 500 quid more. When building a new bike. Just put on those things bikers need. Such as peg springs. Longer front mudguard. Stainless bolts etc. Maybe even offer a cheap version and a Ford ghia version. That's an interesting thought Pocketpete. I'm glad to hear people are linking their 125s. It's the future doncha know. Wow! That was a very well written and interesting review (but shorter paragraphs please). Despite your self-confessed proportions and age, the bike looks like a good fit and the most important thing of all - you really seem to love the bike. Result! Do not use engine oil or any other lubricants for the drive chain, as they may contain substances that could damage the O-rings". Seems like Benelli themselves didn't know what sort of chain they've fitted! Now that I have washed it in paraffin, lubed and adjusted it the chain is definitely not O ring. However, in 1100 miles it had hardly stretched at all, just two flats (1/3 of a turn) on each side was quite sufficient. The bit about 'maintaining it and it will give good service' in my article above remains! Benelli will be using a standardised script from all their models. Plus this way if you or a workshop fit a O-ring chain that's covered too. Or for the foil hat wearing conspiracy theorists Benelli are getting a kickback from the chain lube conglomerate. Great review, I actually found it very interesting and useful so I'm still looking for the test ride before putting money down but I'm not expecting a race bike. But thanks for taking the time to put it down in words. A quick update - the TnT125 exhaust and cat are well known for rusting. As most of my riding is the little back roads of rural Staffordshire I have added a a mudguard extender (eBay £4.95) which keeps the mud and merde off the bottom of the engine and the exhaust system. You're preaching to the converted here at Bikes And Travels NigelS. If you look around you'll see I like to bodge on bits of used oil containers. While I approve of your desire to create a mudguard that actually guards against mud (the clue is in the name) I find your expensive, smart, well fitting and fitted well fender extender to be frankly too posh.